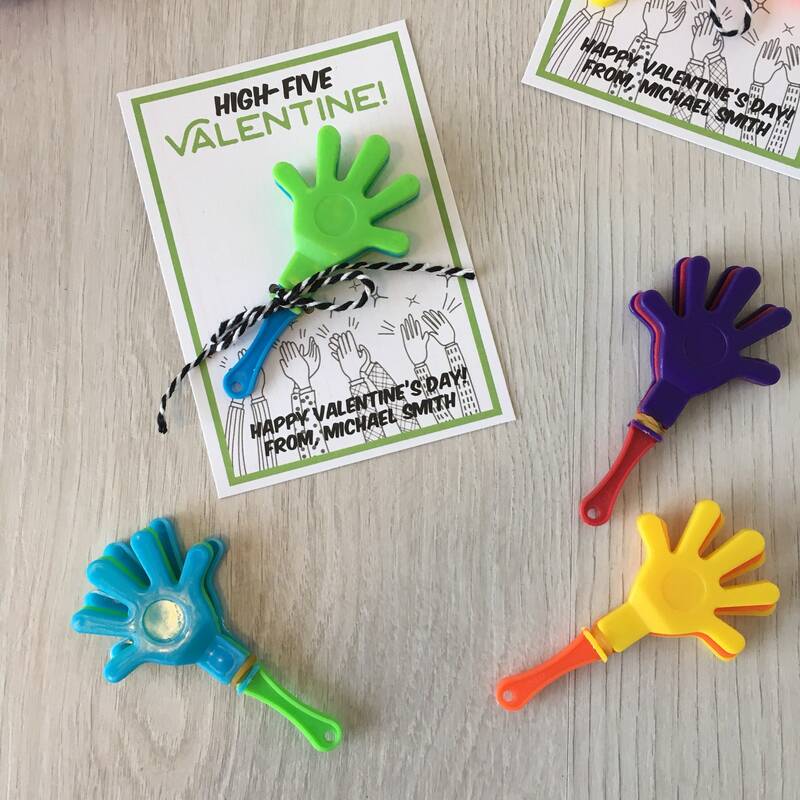 High Five Valentine! 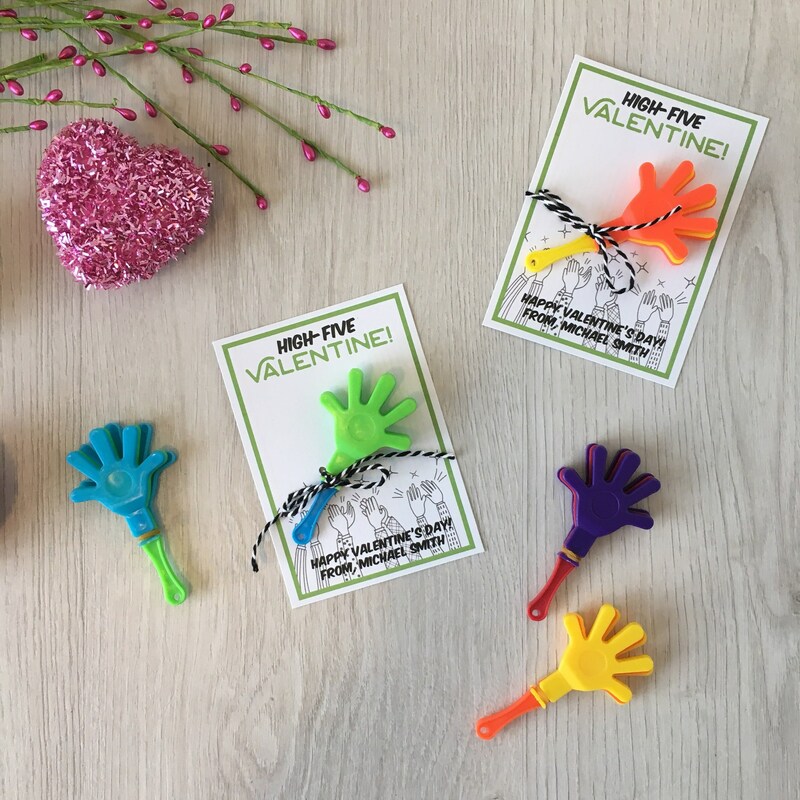 - Handmade Kids Valentines Cards with toy clapper - Candy free, allergy safe - Customizable with childs name! 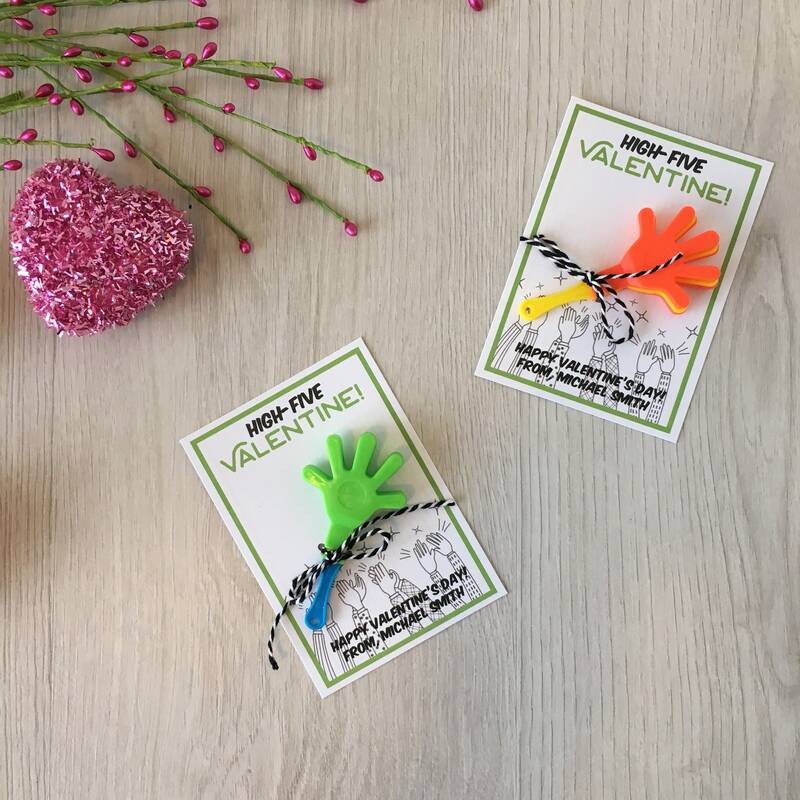 Handmade Kids Valentines day cards customized with your child’s name, sure to be a big hit with kids of all ages! 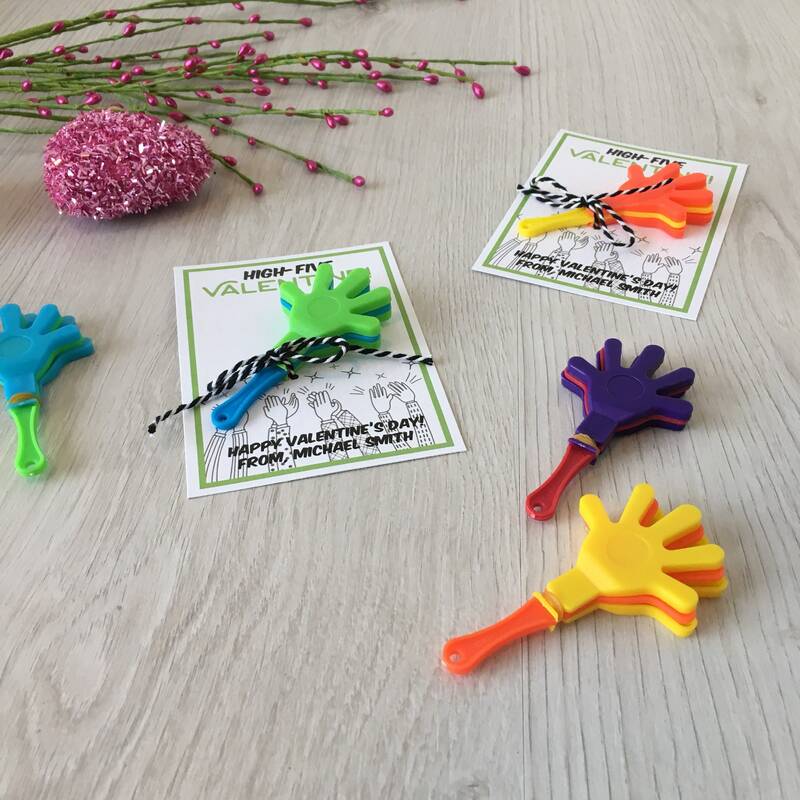 Great to give as classroom gifts to your child's classmates as sugar-free and allergy-free gifts! Printed on a high quality, matte finish cardstock and assembled by hand with love. 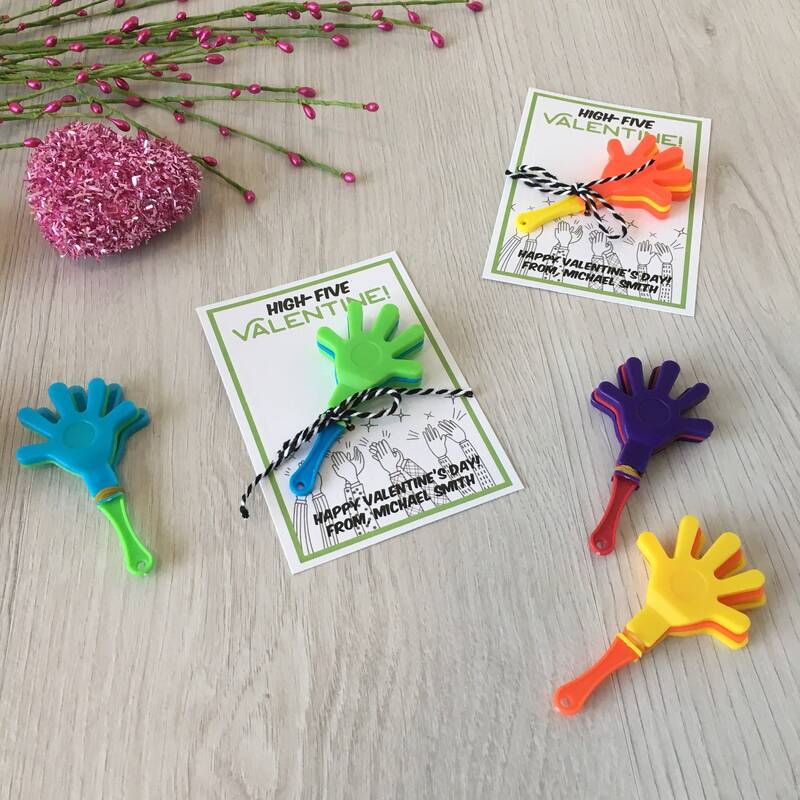 Great as sugar-free and allergy-free classroom gifts! 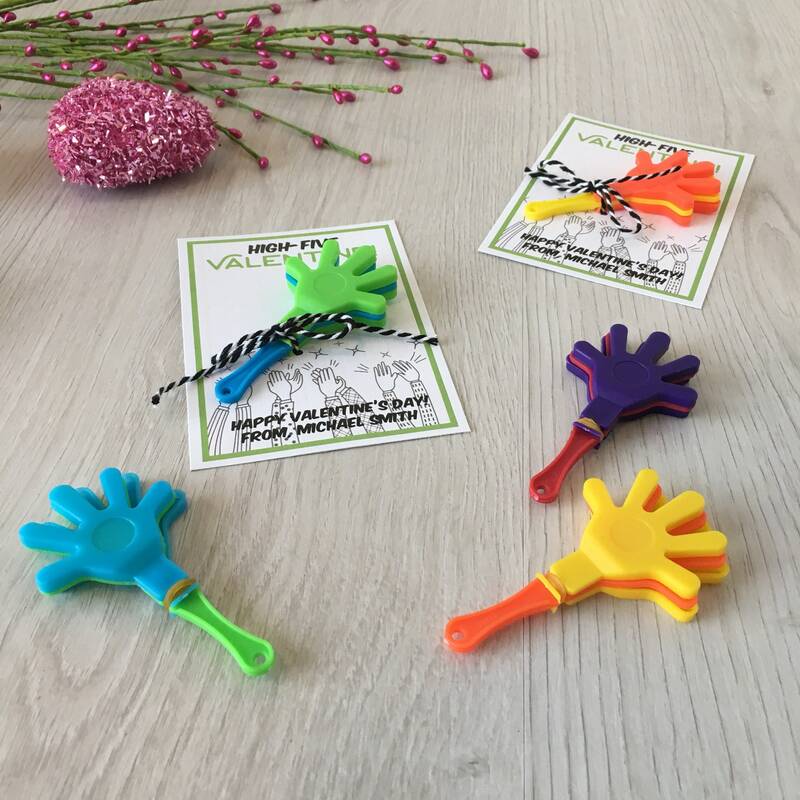 Toy clappers will be an assortment of colors including Blue, Orange, Purple, Green and Yellow. 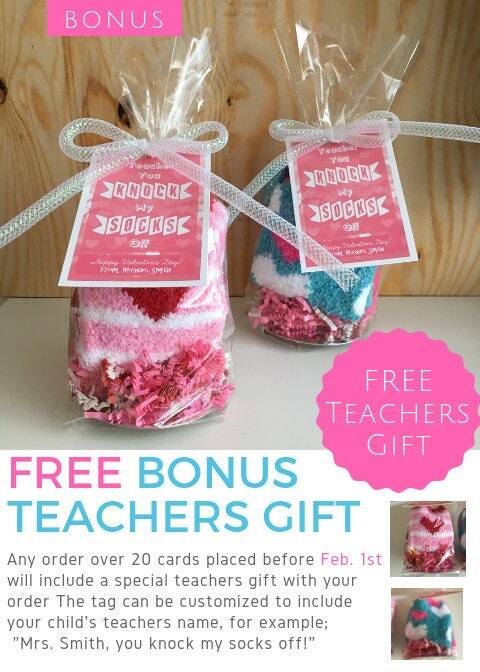 For any order placed before Feb. 1st over 20 cards I will include a special teachers gift of cozy socks wrapped with a tag that can be personalized with your child's name as well as their teachers name. For example the tag reads "Mrs. Smith, you knock my socks off!" 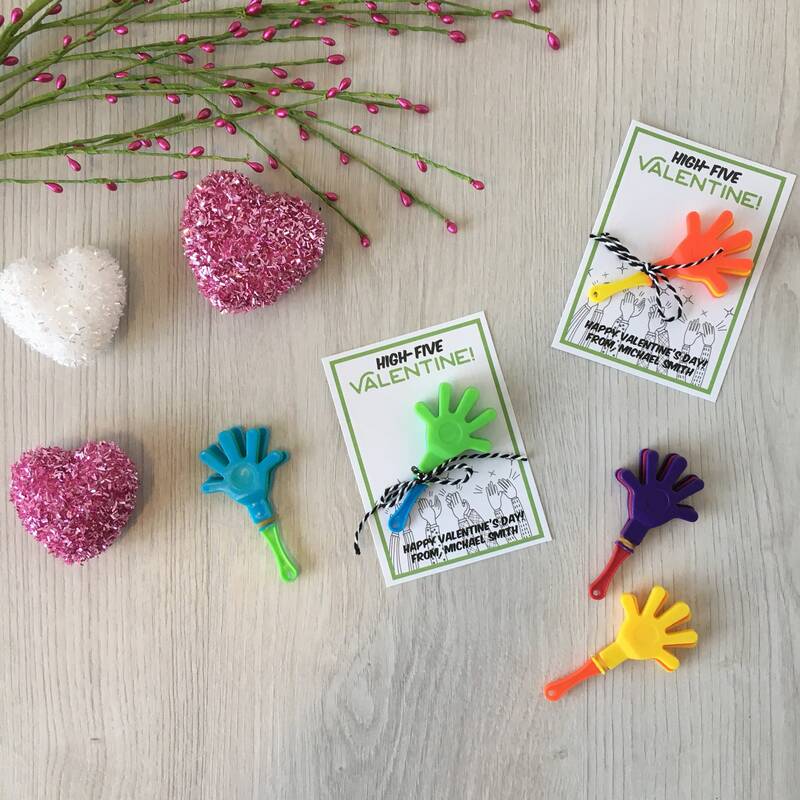 Each of these cards is handmade with care and packaged by hand, because of the handmade nature of these cards please handle with care. 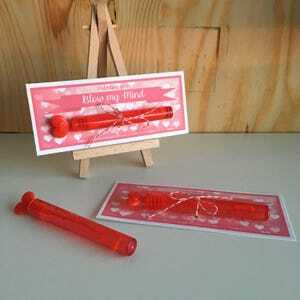 Typically these are made and shipped within 3-5 days of placing your order. I try to have a print proof of the cards sent to you within 1-2 days of your order for approval. Once the card layouts are approved I get everything made and carefully packaged to get on their way to you. If you'd like a completely customized card with your own saying or phrase please contact me, I'm happy to completely customize the tag to anything you'd like. 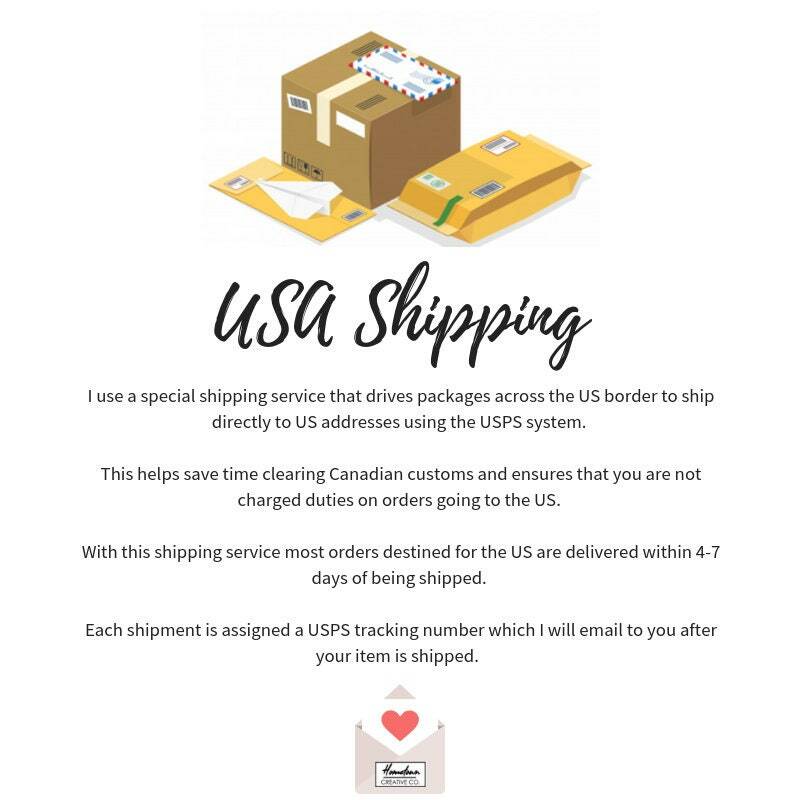 If you need a customized quantity of cards that doesn't work with the quantities I've listed here please feel free to reach out to me and I will create a customized listing for you. Valentine, you are magical! 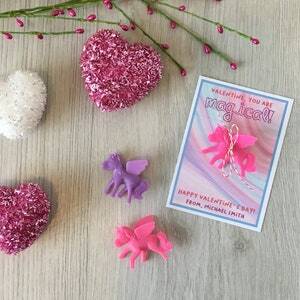 - Handmade Kids Valentines Cards with toy unicorn / pony - Customizable with childs name! 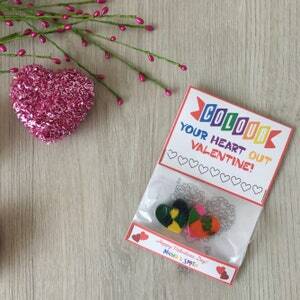 Colour Your Heart Out! 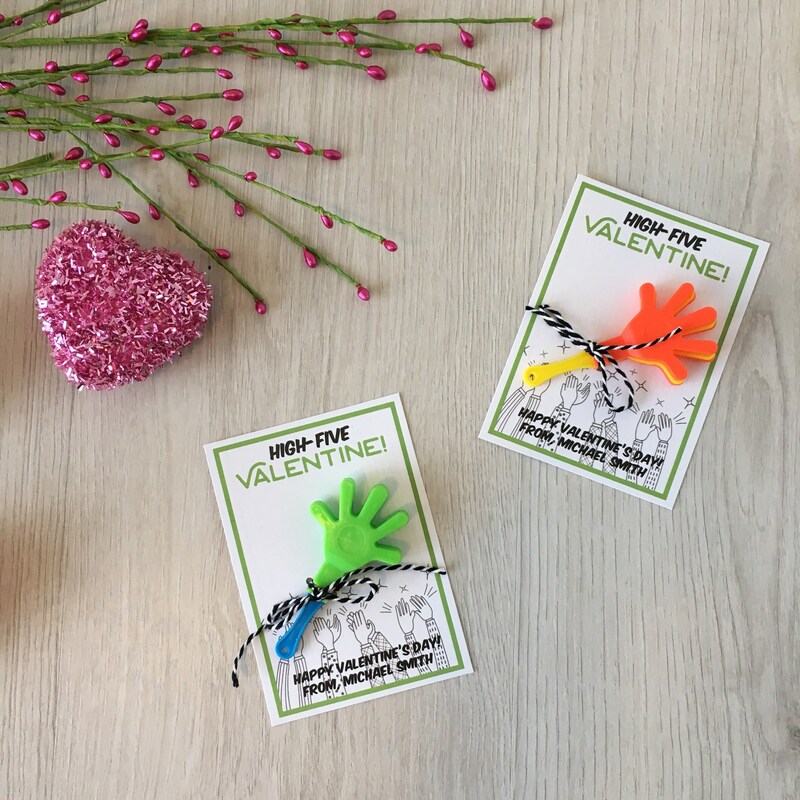 - Handmade Kids Valentines Cards with Handmade Heart Shaped Crayons - Customizable!